We are delighted to announce that Silverstone Heritage Ltd (Registered Charity Number 1166279) supported by the Heritage Lottery Fund will open the Silverstone Heritage Experience at the main entrance to the Silverstone Circuit in spring 2019. 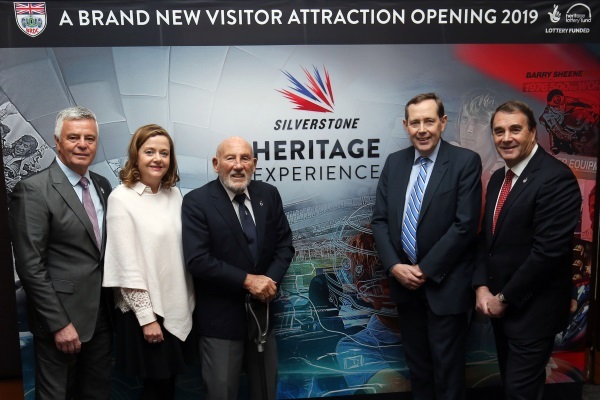 The Silverstone Heritage Experience will bring the extensive heritage of Silverstone and British motor racing to life for an estimated half a million visitors a year, through the creation of a dynamic, interactive and educational visitor experience. A permanent exhibition that will take visitors on an exciting two hour journey through motor racing past, present and future. The exhibition will be housed in the only remaining WWII hanger on the site, which is to the left of the main entrance. The hangar will be fully refurbished and re-clad to create a fantastic, authentic backdrop. The latest technology will be used to tell the amazing stories of the people that have been part of the site’s history, from medieval monks and WW2 air crew to the racing drivers, riders, engineers and marshals of today. A Collections and Research Centre, offering museum and archive accredited storage for the unique British Racing Drivers’ Club (BRDC) archive and other motor sport collections as well as a specialist library and learning space for school groups. A series of themed tours stopping off at iconic sites around the circuit. The Silverstone Heritage Experience will ensure that the heritage of Silverstone and British motor racing is explained and interpreted for today’s public as well as being protected for future generations. It will celebrate the circuit and the country’s position at the very heart of the global motor sport industry by explaining their historic and continuing importance to the sport. For more information about how you can become a founding donor for this project, please click here. The project’s round one application to the Heritage Lottery Fund (HLF) was successful. This gave the project a grant towards the development of a second round application for the full £9.1million grant towards the £20 million project. In addition to the support from the HLF, the Silverstone Heritage Experience Project has also been supported by South Northamptonshire Council, Aylesbury Vale District Council, Buckinghamshire County Council, Northamptonshire County Council, Cherwell District Council, The Beaverbrook Foundation, Buckinghamshire and Thames Valley Enterprise Partnership and South East Midlands Local Enterprise Partnership.